Year 2006 Genie Z30/20N with only 669 hours on the clock. The Z30/20N is an electric powered self-propelled articulating boom with 10.89m working height and is only 1.19m wide. Non marking tyres come standard and this model comes with the optional rotating jib. 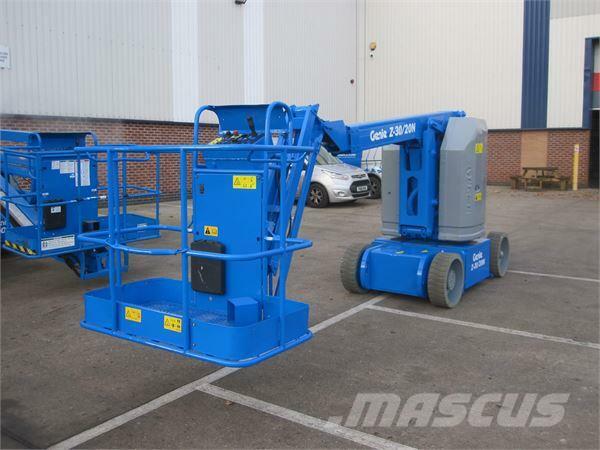 The Genie Z30 is suitable for industrial units for general maintenance and repairs. Two person occupancy with a lift capacity of 227kg. Other standard features include zero-tail-swing and front arm swing allowing to be operated in confined spaces, fully proportional controls to help with precise positioning, AC power to platform for tools and descent/travel alarms. Supplied with a full re-spray, service and thorough inspection. 6-month warranty and new 6-month LOLER certificate included.